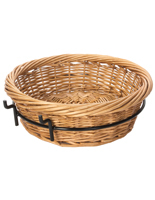 These Mobile Wire Storage Baskets Have Two Locking Wheels for Stability! These White Wire Bin Displays Are Stackable! 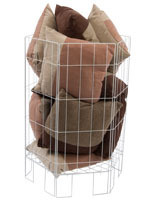 Order Mobile Wire Storage Baskets in Different Sizes Online Today! Large 24"w x 18"h x 24"d open-front basket includes removable divider. Wheeled design includes (2) locking casters for both ease of movement and stability. Sturdy steel-mesh construction has neutral white finish. 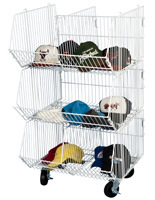 These mobile wire storage baskets can be used as the base unit to a stacking merchandise rack. Each large container is 24" wide x 18" high x 24" deep and includes a removable divider to create two separate bin displays. 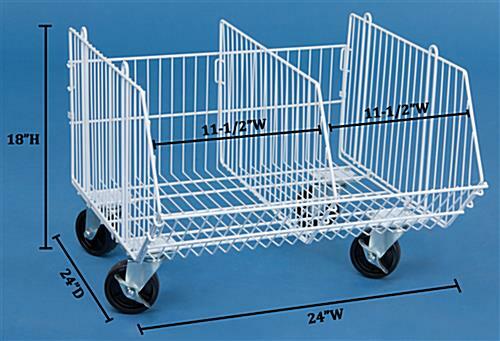 These multi-compartment dump bins, mobile wire storage baskets are made from sturdy and durable steel mesh with a white finish. 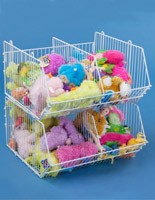 These configurable merchandise holders feature an open-front design to allow easy access to goods. 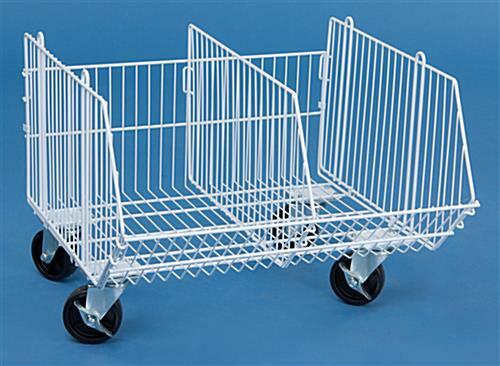 Because two of the four caster wheels can be locked, these mobile wire storage baskets, also known as rolling dump bins, are perfect for use in high traffic areas. Stackable container bulk displays such as these are ideal for showcasing seasonal or sale merchandise in retail environments. 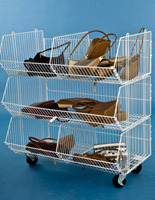 These mobile wire storage baskets can be easily moved from location to location as needed. Each of these dump bin displays with wheels can be used with other non-wheeled stacking bins to create a large rolling merchandise rack. 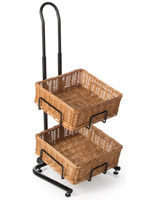 Multi compartment sales displays, such as these mobile wire storage baskets, save valuable space on a sales floor because they can be stacked up yet still keep goods easily accessible and visible. These wheeled units can be assembled by one person in minutes using only a Phillips head screwdriver. 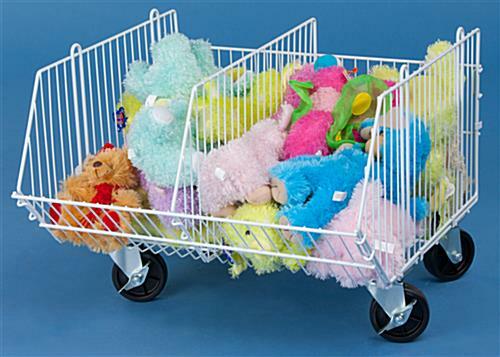 These economical displays, mobile wire storage baskets are perfect for displaying bulk goods in high traffic retail areas. 18.0" x 18.0" x 24.0"
11.5" x 18.0" x 24.0"